It’s coldish up here, ranging from daily maximum of 1 degree celsius to an incredibly warm 10 degrees. On the warm days, we shed layers like reptile skins. 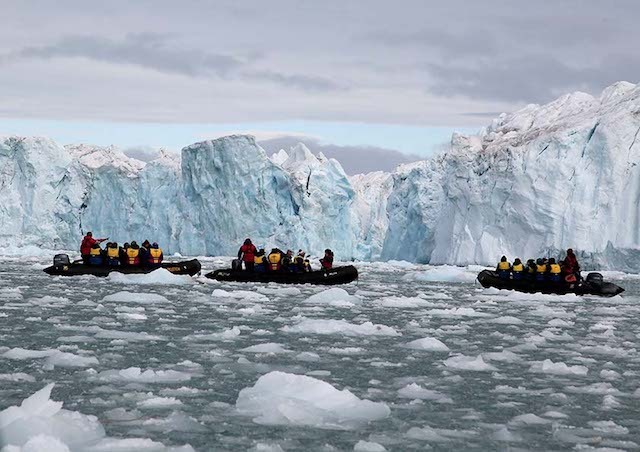 Svalbard is a group of Norwegian islands that extend to just above 80 degrees north. If we went that far south in Antarctica we would be encased in ice but here, we are more likely to encounter bare earth, in what is known as a Polar Desert, with little snow to soften the starkness at this time of the year. The most dramatic feature of this isolated group of islands in the Barents Sea is the enormous glacier front along the southern coast of Nordaustlandet (North-East Land), the second largest island in the group. It is fed by the icecap that covers most of the land mass. 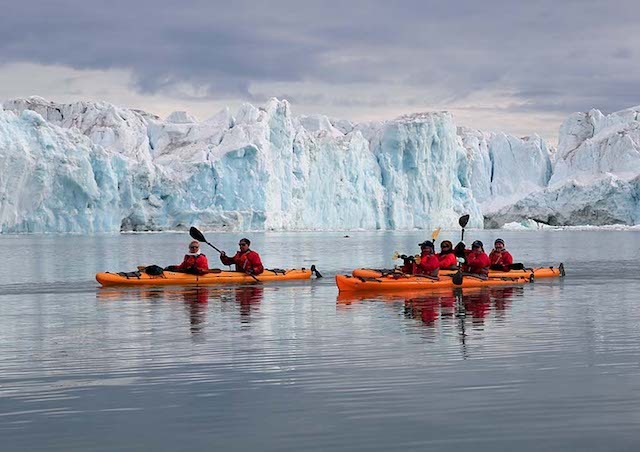 This monster glacier extends unbroken for 170 kms, forming a beautiful and dramatic backdrop to zodiacs and kayaks as we cruised no closer than 300 metres from its majestic heights. The 300-metre-limit is believed to make you safe from being hit or swamped by gigantic bergs breaking off from the parent. We spent a morning admiring the fractured front of the glacier at Klerckbukta. 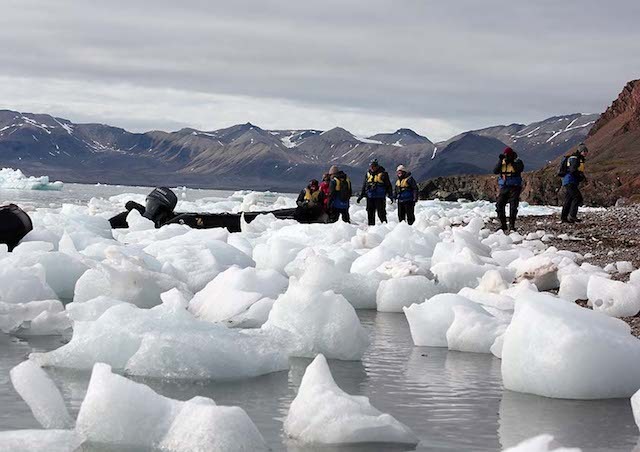 The zodiacs crunched their way through the brash ice, dodged the bigger bergy-bits and maneuvered around the icebergs in all their blue and white beauty. The sea was glassy calm and we reached an area where the water was like a mirror. Stunningly beautiful, and a great setting for our intrepid kayakers. They made for a colourful picture. Later in the day we reached the Brasvelbreen section of the glacier. Whereas Klerckbuckta had been full of crevasses and great masses of fallen ice, Brasvelbreen at first sight is a 30-metre-high sheer wall of ice extending as far as you could see in both directions. On a closer look, this monolithic wall is full of melt water chutes. Water gushes out from the top of the glacier in some spectacular falls, and sometimes makes its way behind the scene and emerges lower down. The top of the wall looks like the parapet of a medieval fort, with notches at fairly regular intervals. 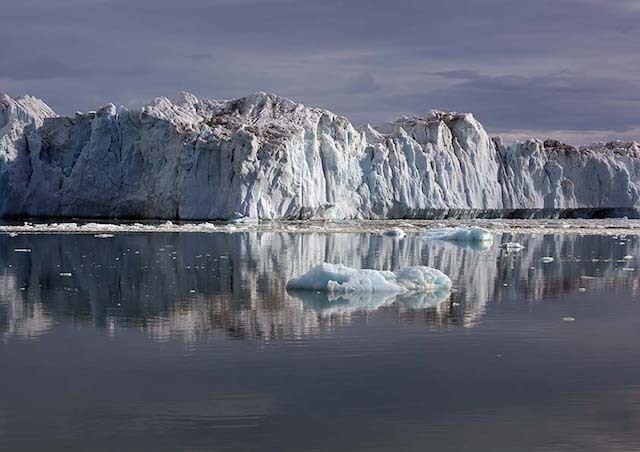 Our first experience of Svalbard glaciers was at Lilliehookbreen on Spitsbergen island where we found ourselves surrounded by a very active glacial front. 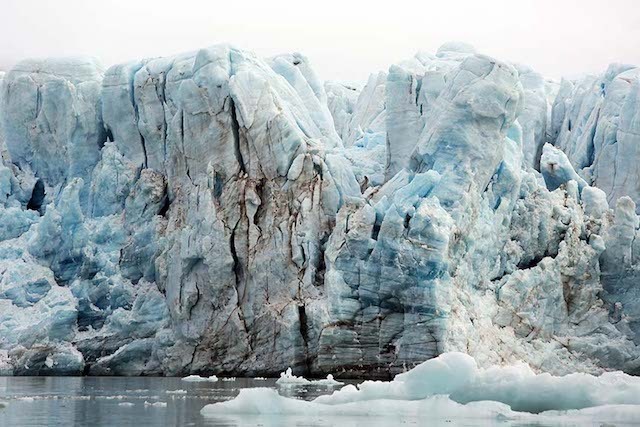 There were plenty of rumblings as calving ice broke away from the glacier, sounding for all the world like a sizable thunderstorm. As we made our way north of the 80-degree latitude we entered a vast field of sea ice. 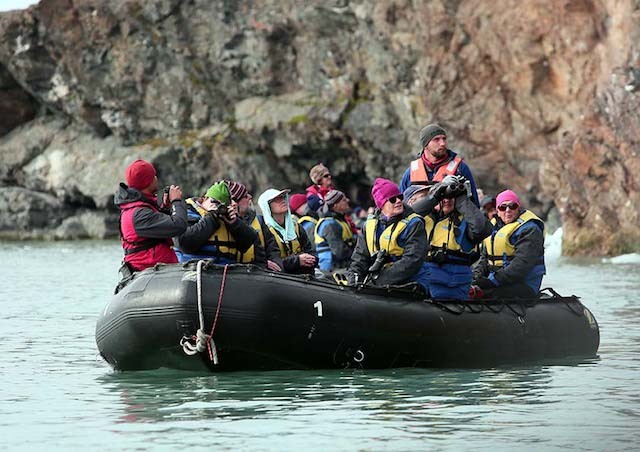 For two days, we crunched our way through, ever on the lookout for polar bears. 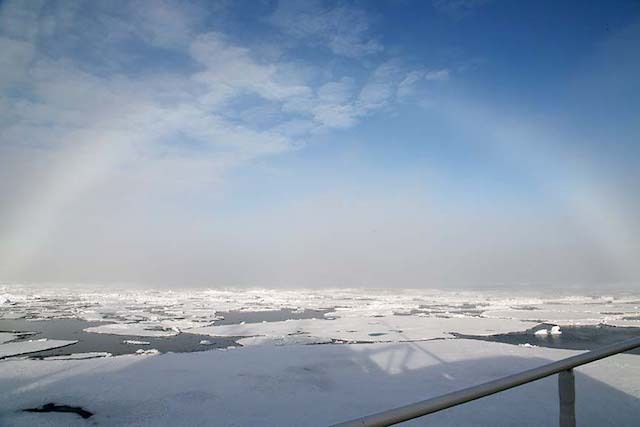 We even drifted overnight in the hope that a curious bear would approach the Polar Pioneer. Unfortunately, no bear appeared then but later, we watched (through binoculars) as a distant bear made three unsuccessful attempts to hunt seals. The first one he actually got his claws into the seal’s tail as it franticly turned to escape. One of our number caught that very short sequence on video. A couple of days later, a bear was spotted in the distance and the ship made its way towards it as it swam between ice floes. Initially it swam away from us and all we could see was its head and an impressive wake as it powered through the water. 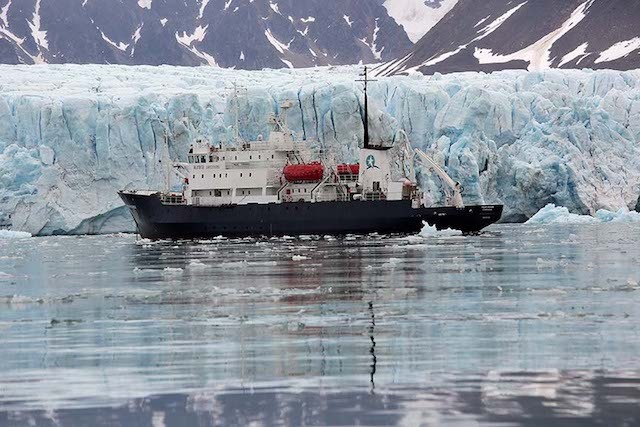 The Polar Pioneer drifted for a while and the bear turned around and made its way towards the ship. Curiosity won out over caution, much to the delight of us all. 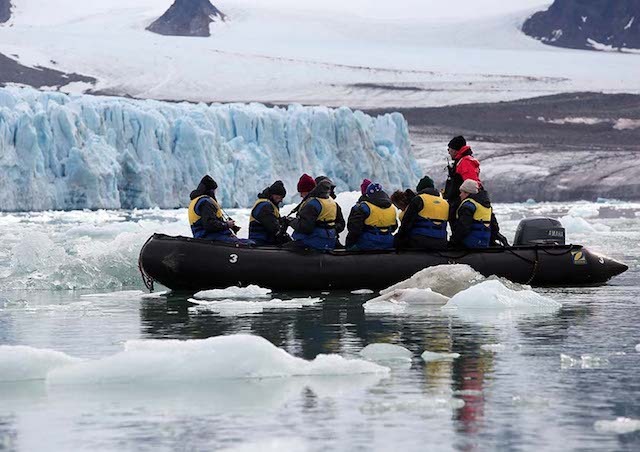 Blue Dot Travel takes small group tours to Svalbard and Iceland. Click here for more details.